Tomorrow I'll be put to work in another department which I'm really excited about cos I'll be working with the "premium" brands and there are less interns, (which means more for me to do!). I will keep you updated and let you know how it goes! Just out of interest, is anyone else interning at the moment? How are you finding it!? the collar is so nice!! love the layered crosses. I really love the collar! So gorge! Seriously can't get over those trousers, you look amazing and I love the necklace! I am in exactly the same situation as you, like I can't even get a simple admin job because they 'need' experience. I've resorted to applying for jobs in retail which I never imagined I'd be doing after leaving uni! I'm sure everything will come right eventually though! oh wow, I’m sorry to hear it’s tough with jobs out there… That must be so frustrating since you put so much work into your education. I believe you’ll get there though!! And an internship is a good start!!! Best of luck to you!! ps. i’m such a sucker for sheer. loving the blouse. pps. i haven’t told you yet but your new blog design looks awesome. i'm in love with your blog! I've just started to the blogging world - so please follow back/comment/view, i'd really appreciate the support! Amazing outfit! You look so cute. Good luck with your new job, something has to come along right. Stunning look, the collar is lovely. 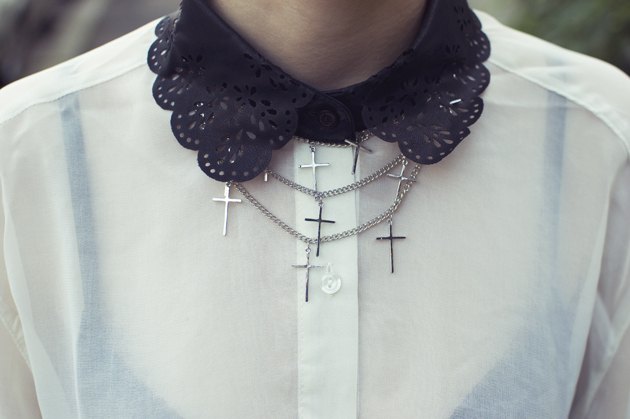 The collar is beautiful, seriously love the blouse & the little crosses necklace too! I know exactly what you mean about uni, when I first applied for uni I needed a degree to get the type of job I was after, but 3 years of hard work (& debt!) later getting that degree & now it counts for nothing! It's really unfair & feels like a waste. I'm glad you're managing to find internships .etc though, they will be super useful & if you stick at it you'll get to where you want in the end! :) I personally couldn't afford to do any internships (living a train journey from London) & them all wanting me to work totally free, it just wasn't doable, so I ended up going freelance! And thank you. I'd be happy to help you but I'm just figuring it out myself, those pictures were my first attempts with the Diana. I love your sense of style, great blouse, it suits you so well! And congrats on getting the internship! Christ, I know how you feel. I'm a qualified journalist and what am I doing? Working in the butchery in Morrisons. HATE. It's so disheartening, especially since I can't move to London yet so I'm basically in the middle of nowhere.